335 Central Ave, Pewee Valley, KY 40056 is a wonderful four Bedroom three and a half Bath home on an acre lot in Pewee Valley, Kentucky! 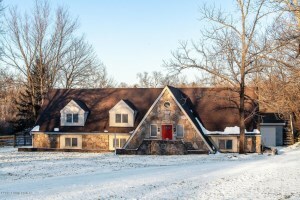 The stone exterior welcomes guests and leads to the entry Foyer. 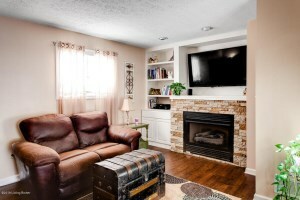 The Den is inviting with cozy brick gas fireplace. 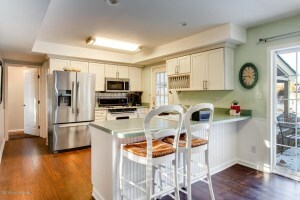 New owners will appreciate the updated Eat in Kitchen wtih breakfast bar and dining area that accesses the back patio. The spacious Family Room is currently used as a nursery. The Living Room is pleasant and sunlit. The Master Bedroom is peaceful with attached Master Bath. There are also three additional Bedrooms (one with its own attached Bath). The other Full Bath & Half Bath both include skylights. The Laundry Room completes the floor plan. Potential Buyers should take note that the Family Room can be easily combined with the nearby Bedroom to form an incredible In Law Suite or Master Suite if desired. 335 Central Ave, Pewee Valley, KY 40056 has a wonderful fenced in yard with an enclosed patio & hot tub. There is also a 4 1/2 car detached garage with an attic above! Several Notable updates include the roof (3 years ago), furnace (5 years ago), fence (1 year ago), and a second hot water heater. The seller is also offering a one year home warranty. This is a great house to make a home! Call 502-371-1173 today for your showing!